In this installment of Mood Pieces I’ll take a look at a game that actually inspired this whole feature in the blog: a small browser based game called Today I Die by Daniel Benmergui, and its new iOS version Today I Die Again. I heard about Today I Die from my fiancé Susi, who poked me a couple of times about the game, until I finally picked it up on a hangoverish depressed afternoon. As it turned out, the timing couldn’t have been much better for this game. 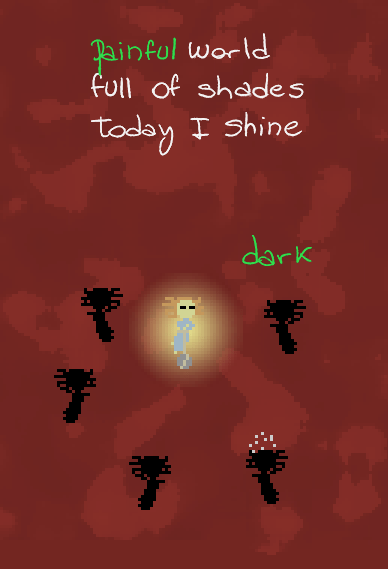 Today I Die is essentially interactive poetry in game form. 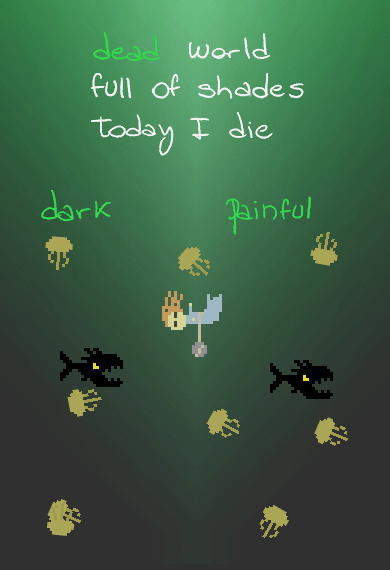 You start with a screen that has a rather bleak poem on it, something that might be your character, and all kinds of threatening or dead deep sea creatures. Gamewise the main aim of the player is to figure out what to do. Moving the character and the elements creates new words that can be used in the poem, and changing the poem changes the game world and the circumstances of the player. Underlying all this is an extremely atmospheric and melancholy soundtrack by Hernan Rozenwasser. The game is very simple in the end. The graphics are retro-blocky, and it doesn’t take more than 10 minutes to finish it, unless you happen to get stuck. Nevertheless the game hit me like a hammer, and when I got to the end, I had a lump in my throat. I was feeling somewhat fragile that day, and Today I Die tapped straight to that something that wants to rise from a bleak hopeless mood and back on to the surface. I just played the remastered iOS version of the game, Today I Die Again, but for me the original browser based game still holds more appeal. It’s hard to say why, but somehow the new version manages to feel a bit too sleek and dynamic compared to the browser version. In any case, this game was the one that gave me an idea of writing about games whose main point for me was an emotional or atmospheric kick to the head. Still waiting for this to creep to the mainstream AAA-level games.